We haven't even had Thanksgiving yet, but I've made up some Christmas cards already. 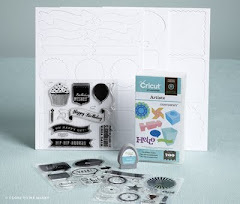 They use the new A Timber stamp set from Close To My Heart. 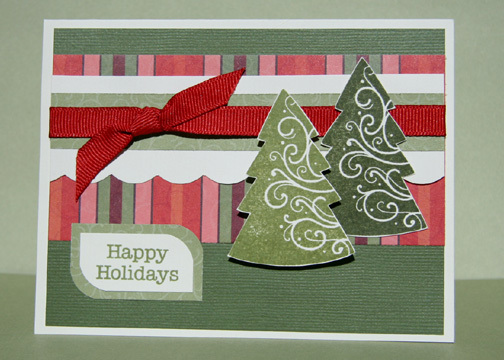 This stamp set sells for just $7.95 and it includes the sentiment "Happy Holidays". The trees are stamped in New England Ivy (darker green) and Garden Green (lighter green) and then cut out with our Microtip scissors. These scissors are incredible for cutting out details and are super sharp. If you don't have one - you should get one. One tree is raised with 3-D Foam Tape. The paper I used is some retired Close To My Heart paper from a couple of years ago, but I decided to use up some of my stash. The scallops were created with my corner rounder. The ribbon is Cranberry grosgrain - roll of 20 yards on sale right now for $4.95. Great deal.